Being a policy wonk in a political town isn’t easy. I care about economic liberty while many other people simply care about political maneuvering. And the gap between policy advocacy and personality politics has become even larger in the Age of Trump. One result is that people who should be allies periodically are upset with my columns. Never Trumpers scold me one day and Trump fanboys scold me the next day. Fortunately, I have a very simple set of responses. If you would have loudly cheered for a policy under Reagan but oppose a similar policy under Trump, you’re the problem. If you would have loudly condemned a policy under Obama but support a similar policy under Trump, you’re the problem. Today, we’re going to look at an example of the latter. The New York Times reported today on Trump’s advocacy of easy-money Keynesianism. President Trump on Friday called on the Federal Reserve to cut interest rates and take additional steps to stimulate economic growth… On Friday, he escalated his previous critiques of the Fed by pressing for it to resume the type of stimulus campaign it undertook after the recession to jump-start economic growth. That program, known as quantitative easing, resulted in the Fed buying more than $4 trillion worth of Treasury bonds and mortgage-backed securities as a way to increase the supply of money in the financial system. I criticized these policies under Obama, over and over and over again. If I suddenly supported this approach under Trump, that would make me a hypocrite or a partisan. I’m sure I have my share of flaws, but that’s not one of them. Regardless of whether a politician is a Republican or a Democrat, I don’t like Keynesian fiscal policy and I don’t like Keynesian monetary policy. Simply stated, the Keynesians are all about artificially boosting consumption, but sustainable growth is only possible with policies that boost production. There are two additional passages from the article that deserve some commentary. First, you don’t measure inflation by simply looking at consumer prices. It’s quite possible that easy money will result in asset bubbles instead. That’s why Trump is flat-out wrong in this excerpt. To be sure, many senior Democrats were similarly wrong when Obama was in the White House and they wanted to goose the economy. Which brings me to the second point about some Democrats magically becoming born-again advocates of hard money now that Trump is on the other side. Democrats denounced Mr. Trump’s comments, saying they showed his disregard for the traditional independence of the Fed and his desire to use its powers to help him win re-election. “There’s no question that President Trump is seeking to undermine the…independence of the Federal Reserve to boost his own re-election prospects,” said Senator Ron Wyden of Oregon, the top Democrat on the Finance Committee. Notwithstanding what I wrote a few days ago, I agree with Sen. Wyden on this point. Though I definitely don’t recall him expressing similar concerns when Obama was appointing easy-money supporters to the Federal Reserve. To close, here’s what I said back in October about Trump’s Keynesian approach to monetary policy. I also commented on this issue earlier this year. And I definitely recommend these insights from a British central banker. Back in January, I wrote about the $42 trillion price tag of Alexandria Ocasio-Cortez’s Green New Deal. To pay for this massive expansion in the burden of government spending, some advocates have embraced “Modern Monetary Theory,” which basically assumes the Federal Reserve can finance new boondoggles by printing money. I debated this issue yesterday on CNBC. Here’s a clip from that interview. I don’t know how far Ms. Kelton would go with this approach. I know from previous encounters that she’s a genuine Keynesian and thus willing to borrow lots of money to finance a larger public sector. But her answer at 2:45 of the interview also suggests she’s okay with using the Federal Reserve to finance bigger government. In either case, our debate is really about the size of government. And anybody who wants a bigger burden of government is at least semi-obliged to say how it would be financed. The MMT crowd stands out because they basically say the Federal Reserve can print money. To help understand the various options, I’ve created a helpful flowchart. It’s possible, of course, for my statist friends to say “all of the above,” so these are not mutually exclusive categories. Though the MMT people who select “Print money!” are probably the craziest. And I hope that they are not successful. After all, nations that have used the printing press to finance big government (most recently, Venezuela and Zimbabwe) are not exactly good role models. I noted in the interview that MMT is so radical that it is opposed by conventional economists on the right and left. For instance, Michael Strain of the right-leaning American Enterprise Institute opines that the theory is preposterous and nonsensical. …modern monetary theory…freshman Democratic Representative Alexandria Ocasio-Cortez spoke favorably about it earlier this month. …MMT is…sometimes a theory of money. MMT is also being discussed in the context of a political program to justify huge increases in social spending. Finally, there is its role as a prescription for macroeconomic policy. …The bedrock observation of MMT is correct: Any government that issues its own currency can always pay its bills. …this is about all that can be said favorably regarding modern monetary theory. …it is in its ideas about macroeconomic policy that MMT fully earns its place on the fringe. …what does MMT have to say about inflation when it does materialize? …it falls to the institution with authority over tax and budget policy — the U.S. Congress — to make sure prices are stable by raising taxes… MMT seems to call for tax increases in order to restrain inflation. …Modern monetary theory…if enacted it could cause great harm to the U.S. economy. From the left side of the spectrum, here’s some of what Joseph Minarik wrote on the topic. MMT rests on simplistic observations that have just enough truth to take in those who need to believe. Believers in MMT see crying societal needs… By common reckoning, government lacks the resources to address all of those needs immediately. MMT solves that problem with a simple and (literally) true observation: The federal government can just print the money. …And that is what willing policymakers choose to hear: Anything. Without limit. It is so convenient — “too good to check.” …to MMT adherents, the Federal Reserve and all other inflation “Chicken Littles” are and forever have been totally wrong. There has not been rapid inflation for 20 years or so. Therefore, there never will be inflation again. …Yes, inflation is low. But it always is before it rises. And once inflation begins, slowing it is hard and painful. MMT is the perfect theory for the video game generation, which never saw the 1960s economic miscalculations so much like what MMT advocates today, and apparently believes that such mistakes can be reversed painlessly by just hitting the reset button. …the consequences could be catastrophic. Letting the inflation genie out of the bottle is not a good idea. And the policies of the MMT crowd presumably would lead to something far worse than what America experienced in the 1970s. Rescuing the economy from that inflation was painful, so it’s not pleasant to imagine what would be needed to salvage the country if the MMT people ever got their hands on the levers of power. Let’s wrap this up. Earlier this week, I presented a guide to fiscal policy based on six core principles. If Modern Monetary Theory gains more traction, I may have to add a postscript. P.S. If ever imposed, I suspect MMT would be very good news for people with a lot of gold and/or a lot of Bitcoin. I don’t care about the current shutdown battle, but I still feel compelled to add my two cents when people make silly arguments about the economy suffering because government is temporarily spending less money. This is actually a two-part debate. From a microeconomic perspective, there is some genuine disruption for affected federal bureaucrats, even if they eventually will get full – and lavish – compensation for their involuntary vacations. And some federal contractors are being hit as well. There’s also a debate about the macroeconomic impact, with some making the Keynesian argument that government spending is somehow a stimulant for the economy. I’ve endlessly explained why Keynesian argument is bad in theory and a joke in reality. In this interview, I tried to make a more nuanced point, explaining that we should focus more on gross domestic income (GDI), which measures how we earn our national income, rather than gross domestic product (GDP), which measures how we allocate national income. I’m not sure I got my point across effectively in a 30-second sound bite, but it’s a point worth making since people who understand GDI are much less susceptible to the Keynesian perpetual-motion-machine argument. Harold Furchtgott-Roth, in a column for the Wall Street Journal, analyzes the potential macroeconomic consequences of the shutdown. Does the U.S. government shutdown endanger economic growth? It has led to missed paychecks… Yet these employees represent approximately 0.5% of all American workers… The effect of the furloughs on gross domestic product is likely small. …U.S. GDP is more than $20 trillion annually, or approximately $55 billion daily. The daily compensation of furloughed federal workers is about $52.5 million, or less than 0.1% of GDP. This figure does not include affected government contractors, but even doubling or tripling this figure yields only a small share of GDP. …The net effect of the partial shutdown on direct salaries and wages will primarily be to delay, but not reduce, income for the affected families. …Maybe that’s one reason the stock market, a barometer of expectations of future economic growth, has been unperturbed by the budget impasse. The Dow and the S&P 500 are up nearly 9% since the shutdown began Dec. 22. Experience also gives reason for optimism. The last major government shutdown occurred in 1995-96. It affected the entire federal government, not only part of it. 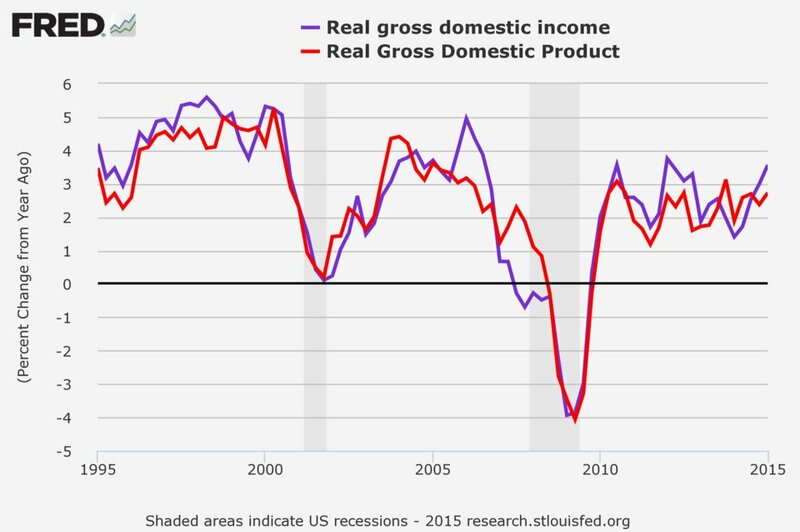 Yet U.S. GDP growth increased from 2.7% in 1995 to 3.8% in 1996. That final sentence is key. The Keynesians are always predicting bad consequences when there’s some sort of policy that limits government spending. But the real-world outcome is always different, as we saw with the sequester. Steve Malanga, writing for the City Journal, takes a microeconomic perspective on the shutdown. Steve’s column reminds me of a piece I wrote back in 2013. 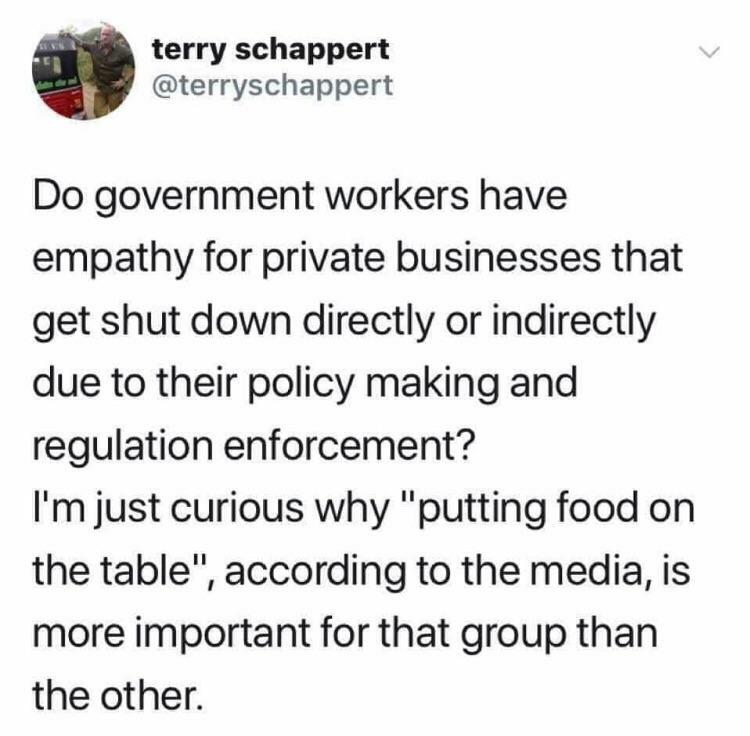 Which is why I wish one of the lessons we learned from the shutdown fight is that much of what government does is either pointless or counterproductive. I’m not holding my breath waiting for that to happen. Anyhow, no column on a government shutdown would be complete without some satire. We’ll start with a sarcastic observation from Libertarian Reddit. Though it actually raises a serious point. I want to downsize Washington, but I don’t want any needless pain for bureaucrats. Yet shouldn’t we be similarly sensitive to the plight of folks in the private sector who suffer because of D.C.’s bad policies? And it appears that government bureaucrats have figured out what to do with their hands now that they have extra time on their hands. For what it’s worth, some bureaucrats engage in such recreation even when the government is open. If you enjoy shutdown humor, you can find older examples here and here, and a new example here. When I give speeches on Keynesian economics, I usually begin with a theoretical discussion on why consumer spending is a consequence of growth rather than the cause of growth. I then focus on two reasons to be skeptical about borrow-and-spend schemes to artificially boost growth. In the short run, it makes no sense to “stimulate” an economy by borrowing from one group of people and giving the money to another group of people. It’s like trying to become richer by taking money out of your left pocket and putting it in your right pocket. In the long run, so-called stimulus creates a ratchet effect for larger government since politicians rarely obey Keynes’ admonition to cut back on government spending and run surpluses when the economy is in an expansion phase. But I oftentimes include a caveat when discussing the first point. It is possible, I hypothesize, to increase your short-run consumption if you take money out of a foreigner’s left pocket and put it in your right pocket. I hasten to add that this is probably not be a wise course of action since the money may be squandered and you simply wind up further in debt, but I admit that the short-run consumption data will be better. Well, there’s a new academic study on exactly this issue from the European Stability Mechanism (sort of an IMF for eurozone countries). Here’s what the authors decided to investigate. In this paper, we argue that there is a natural and largely unexplored connection between fiscal multipliers and the foreign holdings of public debt. The intuition is simple….fiscal expansions can…have crowding-out effects on the domestic private sector. Probably the most important among the latter is that the resources used by the domestic private sector to acquire public debt can detract from consumption and investment. This implies that the crowding-out effect of fiscal expansions is likely to be stronger when they are financed by selling public debt to domestic (as opposed to foreign) residents. Here’s some of the data on foreign holdings of national debt. Our data on foreign holdings of public debt reveals interesting patterns. First of all, there is significant variation across countries: in some countries, such as Canada and Japan, the share of public debt held by foreigners is consistently low, whereas in others, such as Finland and Austria, foreigners hold more than 75% of public debt towards the end of the sample. Over time, in line with the rise of financial globalization, the general pattern is one of increasing public debt in the hands of foreigners. In the United States, for instance, the share of public debt held by foreigners has increased from less than 5% in the 1950s to close to 50% today. 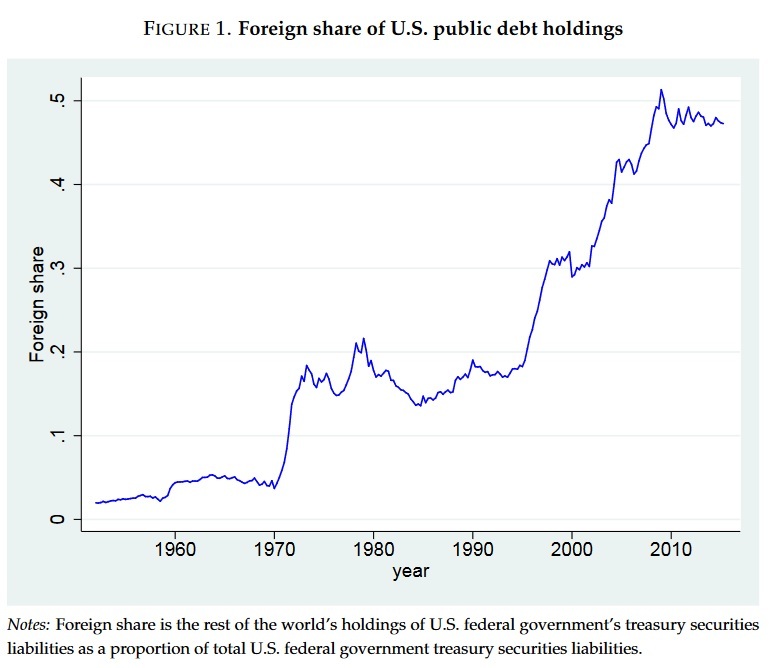 And here’s a chart from the study showing how foreign holdings of U.S. government debt have increased over time. And their conclusions, after crunching all the numbers, is that nations can boost short-run consumption if a significant share of new debt is financed by foreigners. Our main result is that, consistent with the previous argument, the estimated size of fiscal multipliers is increasing in the share of public debt that is in the hands of foreigners. 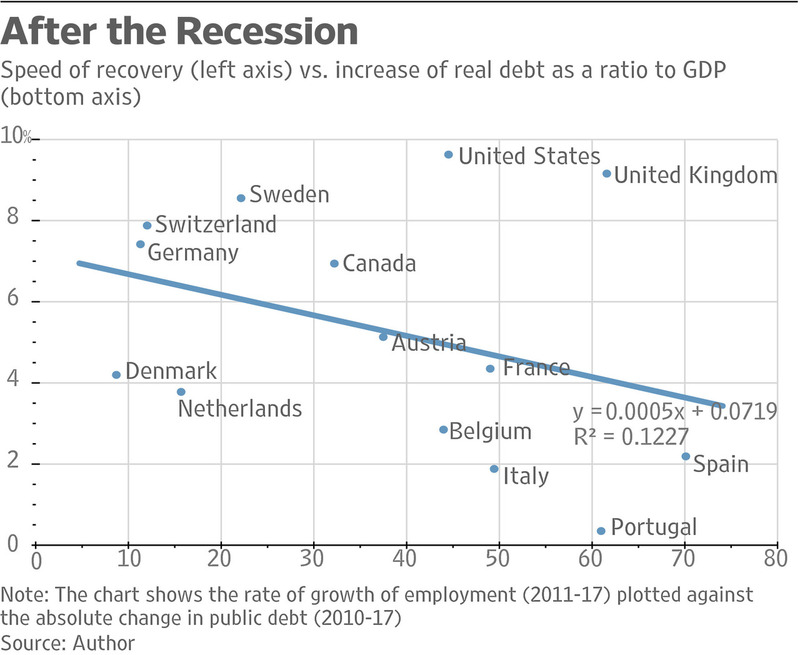 This result holds both for the United States during the postwar period, and for a panel of advanced (OECD) economies over the last few decades. …We find that the average foreign share, i.e., the share of public debt held by foreigners before a fiscal shock, …reflect capital inflows, which help finance fiscal expansions thereby minimizing their crowding-out effects on domestic investment. Incidentally, the authors acknowledge that this creates a beggar-thy-neighbor effect. Our findings…point to a potentially negative spillover: to the extent that fiscal expansions are financed via foreign borrowing, their crowding-out effects are exported and consumption and investment are reduced elsewhere. In other words, any transitory benefit one country experiences will be offset by losses elsewhere. But politicians barely care about their own voters, much less those who live in other countries, so that certainly would not be an effective argument against Keynesian spending binges. For what it’s worth, I still think the most persuasive argument is that Keynesian economics has an awful track record, even if there’s some ability to shift part of the short-run cost onto foreigners. 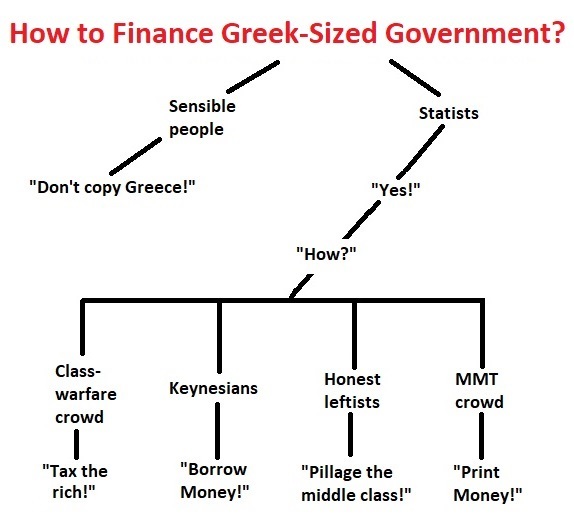 After all, ask Keynesians to identify an example of successful government stimulus. They certainly can’t pick the big-spending era of Hoover and Roosevelt. That was a flop. Japan is another example of Keynesian economics producing debt rather than growth. And the Obama stimulus also bombed. Indeed, the unemployment rate didn’t drop until afterwards. And let’s not forget that the long-run costs are always negative because larger government sectors necessarily lead to smaller productive sectors. P.S. I feel somewhat guilty for writing a column that acknowledges a potential benefit (albeit transitory and unneighborly) of Keynesian economics, so allow me to expiate my sins by sharing this comparison of Keynesian economics and Austrian economics. For what it’s worth, I think the Austrians over-emphasize the importance of interest rates. 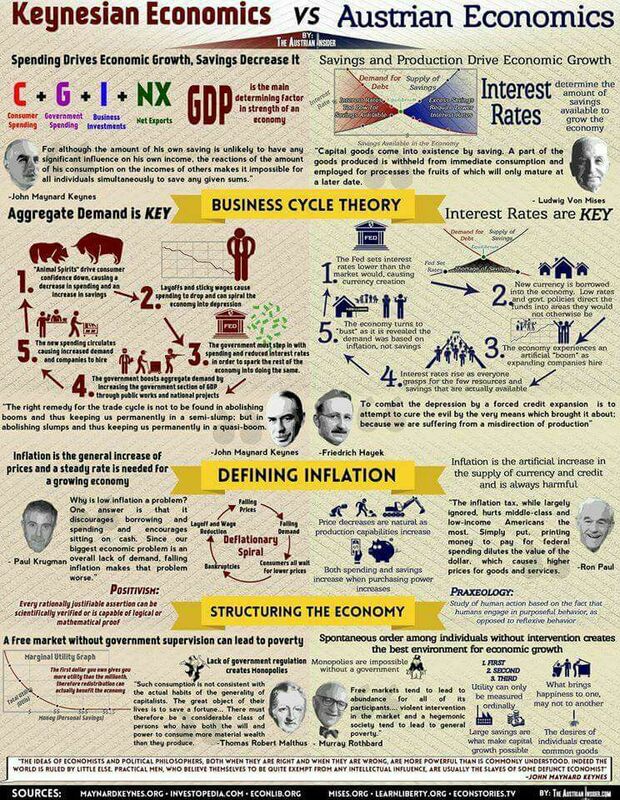 But there’s no question they are much closer to the truth than the Keynesians. P.P.S. 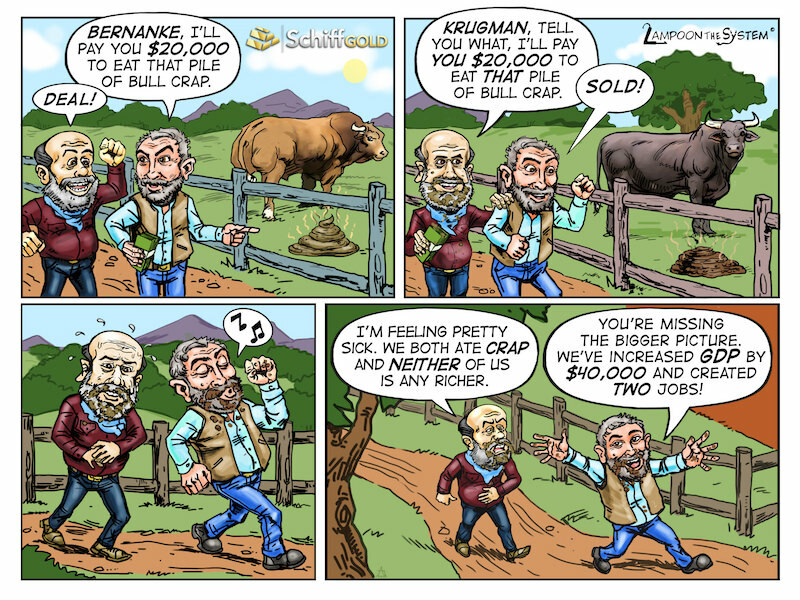 If you want to enjoy some cartoons about Keynesian economics, click here, here, here, and here. Here’s some clever mockery of Keynesianism. And here’s the famous video showing the Keynes v. Hayek rap contest, followed by the equally enjoyable sequel, which features a boxing match between Keynes and Hayek. And even though it’s not the right time of year, here’s the satirical commercial for Keynesian Christmas carols. Yet Keynesian economics has “perplexing durability,” probably because the theory tells politicians that their vice of profligacy is actually a virtue. But there are some economists who genuinely seem to believe that government can artificially boost growth. They claim terrorist attacks and alien attacks can be good for growth if they lead to more spending. They even think natural disasters are good for the economy. I’m not joking. As reported by CNBC, the President of the New York Federal Reserve actually thinks the economy is stimulated when wealth is destroyed. I’m always stunned when sentient adults make this kind of statement. Should we invite ISIS into the country to blow up some bridges? Should we dynamite new buildings? Should we pray for an earthquake to destroy a big city? Should we have a war, featuring lots of spending and destruction? All of those things, along with hurricanes and floods, are good for growth according to Keynesian theory. Jeff Jacoby explains why this is poisonous economic analysis. Could anything be more absurd? The shattering losses caused by hurricanes, earthquakes, forest fires, and other calamities are grievous misfortunes that obviously leave society poorer. Vast sums of money may be spent afterward to repair and rebuild, but society will still be poorer from the damage caused by the storm or other disaster. Every dollar spent on cleanup and reconstruction is a dollar that could have been spent to enlarge the nation’s reservoir of material assets. Instead, it has to be spent replacing what was lost. …No, hurricanes are not good for the economy. Neither are floods, earthquakes, or massacres. When windows are shattered, all of humanity is left materially worse off. There is no financial “glint of silver lining.” To claim otherwise is delusional. By the way, I don’t think any Keynesians actually want disasters to happen. They’re simply making a “silver lining” argument that a bad event will lead to more spending. In their world, what drives the economy is consumption, and it’s the role of government to either consume directly or to give money to people so they will spend it. In a recent interview, I pointed out that investment and production are the real keys to growth (which is why I prefer GDI over GDP). Increased consumption, I explained, is a result of growth, not the cause of growth. You’ll notice I also threw in a jab at the state and local tax deduction, a loophole that needs to be abolished as part of tax reform. But let’s not get sidetracked. For those who want to do some additional reading on Keynesian economics, I recommend this new study by a couple of professors. Here’s a blurb from the abstract. …Keynesians assert that even wasteful government spending can be desirable because any spending is better than nothing. This simple Keynesian approach fails to account, however, for several significant sources of cost. In addition to the cost of waste inherent in government spending, financing that spending requires taxation, which entails an excess burden. Furthermore, the employment of even previously idle resources involves opportunity costs. I’ll close by augmenting theory and academic analysis with some real-world observations. Keynesian economics didn’t work for Hoover and Roosevelt, hasn’t worked for Japan, didn’t work for Obama, and didn’t work in Australia. Indeed, Keynesians can’t point to a single success story anywhere in the world at any point in history. Though they always have an excuse. The government should have spent more, they tell us. P.S. Since their lavish tax-free salaries are dependent on pleasing the governments that finance their budgets, international bureaucrats try to justify Keynesian economics. Here’s some recent economic alchemy from the IMF and OECD. P.P.S. I frequently urge people to watch my video debunking Keynesian economics. Though I admit it’s not nearly as entertaining as the famous video showing the Keynes v. Hayek rap contest, followed by the equally enjoyable sequel, which features a boxing match between Keynes and Hayek. And even though it’s not the right time of year, here’s the satirical commercial for Keynesian Christmas carols.